The region in general is a haven for outdoor enthusiasts. Hikers, bikers, rock climbers, backpackers, kayakers, fishermen. Did I leave anything off the list? What I really love about the region is that it is also only two hours from Portland. But since it is on the east side of the Cascades, the scenery suddenly shifts from lush and green foliage to shrubby juniper and sagebrush. There are also visible basalt rock formations, a gift left behind from millions of years of lava flows. When most people envision Oregon, they think green and lush. Yet most of the state is more desert like. In the last two summers, I visited the Owyhee Canyon and the Wallowas. Both of which are in Eastern Oregon. So, this group was a mixture of those from Bend area and those from Portland. This year I offered to drive and by 7 AM, I was on the road with a car full of eager river goers. Maupin is a small town, slightly larger than, you will miss it if you blink. 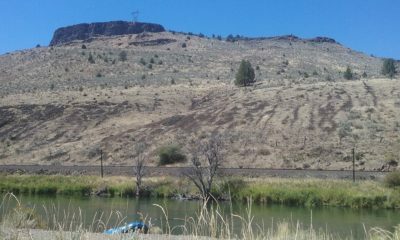 Often a town will sit perched up high on a hillside, but Maupin is a settlement right on the river. In the miles preceding it, we wound down a hillside and descended upon it. I suspect Maupin gets 95% of its business in the summer months. For those who live there, it is feast or famine. Sounds unpleasant, but it actually attracts people who love the solitude for that much of their lives. The people and the place are well matched. Deschutes U-Boat got us set up for a day of fun on the river. 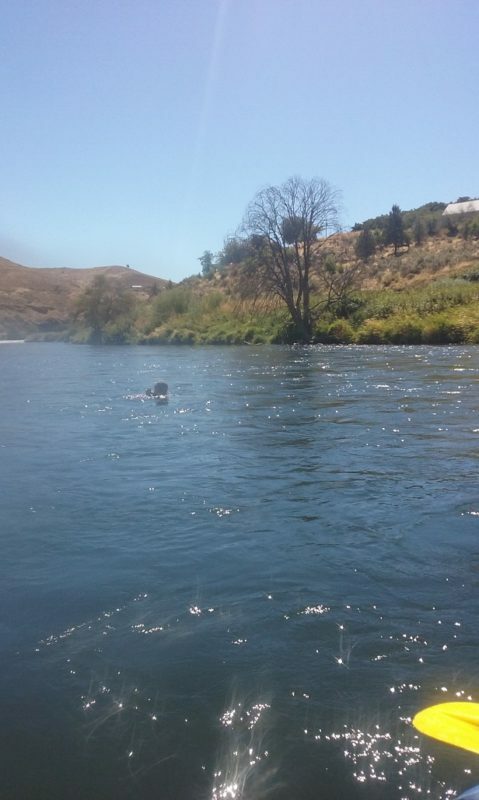 We put in four miles upriver from Maupin and Nick would meet us about ten miles downriver from Maupin at an agreed upon time. We were well stocked with snacks and drinks and everything one could need for an afternoon. Drinking in moderation was fine, but we did have a boat to row after all. Lara was our guide and she has rafted the Deschutes several dozen times. In the stretch we do, there are three big rapids. The rest is smooth sailing, although there were points we were instructed to row. For me, I like to keep active, so sitting on the boat only admiring the beauty of the canyons had me getting antsy. I liked multi-tasking with rowing and nature admiration happening simultaneously. Spotting osprey nests was very cool. They take telephone poles and turn it into a home by building a nest atop it. After all, this is prime seating for looking for the fish in the river! The river was higher than it may normally be in mid-August, because we had a very rainy winter. This meant the rapids were not as fierce as they have been at other times. However, Lara warned us about Boxcar, said it was Level III, and gave us the safety rap ten minutes before we approached it. We rowed like our lives depended on it, left side backward, right side forward! Keep rowing, keep rowing, don’t stop now! Now it was a rapid, no doubt, but some of us recalled the year Lara got catapulted from the back of the boat on Boxcar and compared to that, it was mellow. 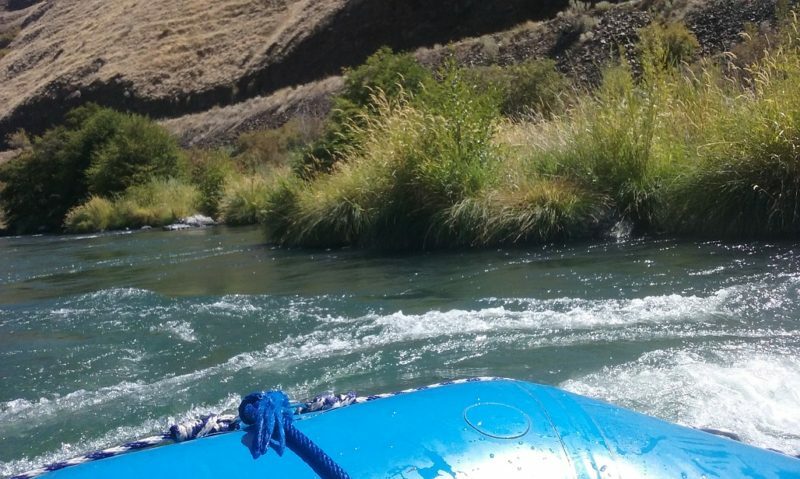 Lara and I had mentioned the idea of rafting the Rogue (in Southern Oregon) together, which would involve assembling a team of people to join us (we would have three or four boats, each with a guide who would row). Summer was ticking away and it honestly would not come together this season, but it was not too late to get an early start on next season! We put it out to the group to see who would take a serious interest in joining us. It would be a four day trip in the spring, which would help us avoid the crowds of summer. And how great would it be to be on the river for the duration of a work week!? Speaking of crowds, there were none to be had on this day. We have done this stretch of the river before, on the same week and it is common to be able to spot three to five boats from any particular vantage point. With the media predicting (probably dramatizing) record level crowds coming to Central Oregon for the eclipse the following weekend, it seemed as though everyone decided to stay home. They all thought “we can’t go anywhere, since everyone will be there!” And the result was, nobody was there – which was a pure delight. So it was the eight of us rafting the Deschutes River, and the flamingos. Approaching our take out, there was a sign warning the boaters that this is the last take out. If you don’t pull over, you are taking a life threatening risk. While I was daydreaming about staying on the boat all day, flowing into the Columbia River and back to Portland (or to the ocean), I guess that was not realistic. There is a section downstream that gets very hairy and frankly, cannot be rafted safely. We did have a bit of an exciting moment when Ted lost an oar. It got caught on some rocks and the pressure was too much. We caught a glimpse of the yellow oar bobbing in the water. Since our boat was going faster than it was, so it would not catch up with us. We were able to pull over and those on the right side of the boat held onto some rocks while Ted climbed out of the boat and carefully treaded the terrain to retrieve the oar. I was on the left side of the boat, and I could see them struggling to hold on. The water rushing past wanted to keep our boat moving along. Success, the oar was recovered, he climbed back in and once again we were off like a prom dress. 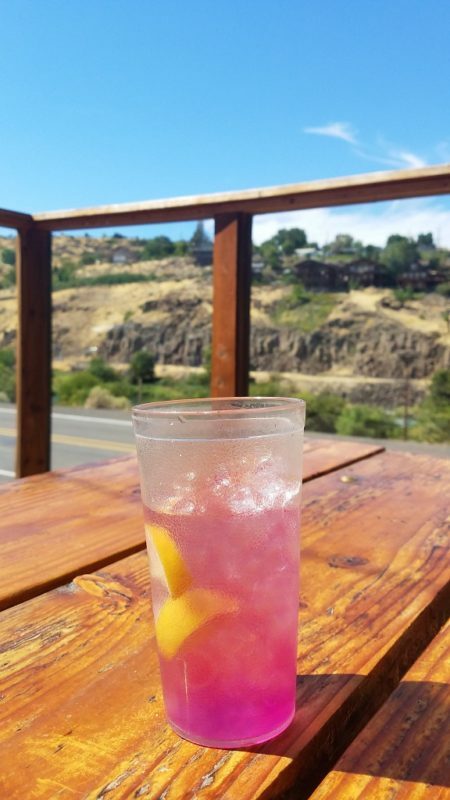 The dining scene in Maupin is limited and we ended up at The Riverside which offered some much needed shade in the heat of the day. Ironically, when we were getting wet rafting at 10 AM, I was cold. Now that the mercury was climbing and we were out of the water, I would have loved to dunk myself in the river! A bowl of ceviche and beet salad hit the spot on a summer day. It was around 3 PM when we were hugging each other goodbye. And honestly, it was hard to believe we had managed to pack that much fun into six hours. Before we left, Lara and I inked some dates in our calendars, so she could teach me how to guide a boat for the spring time Rogue River trip. I am always up for embarking on new and interesting things and expanding my skill set. And while it is not always easy to teach an old dog new tricks, it is possible, if the dog (me) is eager and willing. So stay tuned, because next April, I will be writing about my trip rafting the wild and scenic Rogue River!